Custom roman shades can be almost anything you desire! Roman shades are typically not an inexpensive option as they are very labor intensive and fabrics vary quite a bit in price. Depending on how the shade is designed, a roman shade can be a very formal or informal look. We see a ton of fun and funky fabrics used to brighten up a small bathroom or colorless kitchen. Cordless roman shades are becoming a much more popular product when there are small children in the home. When you contact us about roman shades, we’ll go through the following steps. Blind Faith carries an extensive line of fabrics that can all be turned into a one of a kind shade. You can view our fabrics online, come by our showroom and browse through our hundreds of books or schedule an in home consultation for us to bring a smaller selection out to you. Our roman shades come with a standard liner to protect the back side of the shade from sun damage, but black out lining can be added to provide room darkening features. Please note that the pin holes from sewing the rings onto the back of the draperies will become more pronounced with the blackout lining. Unlined roman shade styles are available for a sheer appearance. However, with direct sunlight the fabric shade will not last as long due to the sun damage of the fabric. Once you’ve found that perfect fabric, it’s time to design your roman shade. Flat roman shades are the most popular style of roman shades. With the lack of folds, the pattern is fully visible making it a great option for both large and small prints. Because there are no sewn in pleats, this type of roman shade does take some training to fold up when operated. Reverse fold roman shades provide more structure as pleats are sewn into the shade. This roman shade is shown with the valance option giving a more tailored appearance. Hobbled roman shades are a more elegant option great for formal dining rooms. Folds of fabric are sewn into the shade giving a waterfall like appearance. Hobbled roman shades do require more fabric and are, therefore, more expensive. This shade is shown with a coordinating cornice giving it a finished appearance and bringing more style and texture into the room. Soft roman shades provide a more informal look with permanent folds of fabric tacked into the bottom of the shade. This is a great look for shabby chic rooms where added texture and softness is desired. In this picture, valances are added to bring in color and pattern and finish off the top of the shades. Soft roman shades can also be designed with a sheer fabric to diffuse the light and add softness while maintaining a beautiful view. 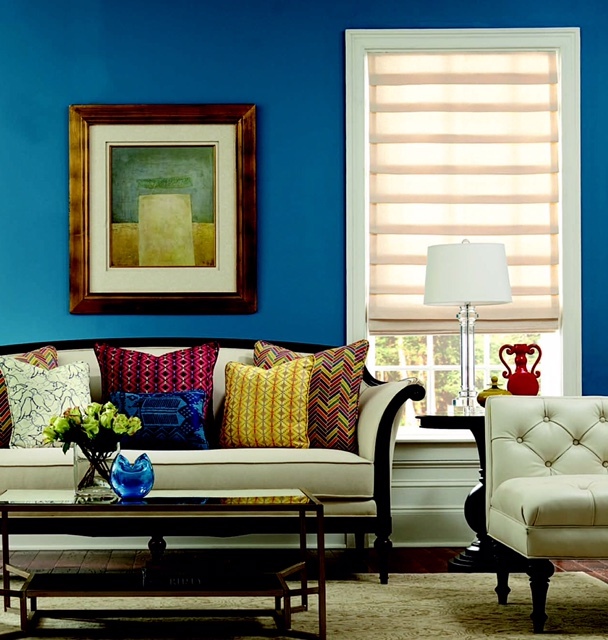 Soft roman shades are typically outside mounted shades. Slouch roman shades have a permanent fold of fabric at the bottom. Depending on the fabric chosen, this type of shade can be a casual or elegant design. This type of shade takes more dressing when operated due to the lack of horizontal pleats and is recommended as an outside mount product. In this picture, the top of the shade is covered with a cornice providing a taller appearance to the window and finished look. Pleated balloon roman shades (shown with an added cornice here) add softness and texture to a room. The classic design is created with deep pleats falling into tailored poufs of fabric. This type of shade is typically an outside mount and will require dressing as it’s operated. Due to the amount of material used in construction, this type of roman shade can be very heavy to lift and is best suited for areas where the shade will not be raised and lowered often unless the shades are designed to be sheer without lining and using a light weight fabric. Shirred balloon roman shades are very similar to the pleated balloon roman, but without the sewn in pleats. The fabric is gathered along the header adding a lot of texture to the space. Austrian sheer shades are constructed with shirred vertical sections that provide an elegant softness to any room. They are designed to be outside mount only and are not offered with a lining. This type of shade is best for light weight, sheer fabrics and may take more dressing of the pleats at first, but after being operated several times, the fabric will form a memory of the pleats. In this picture, the shades are coupled with grommet top side panels providing a modern look to an otherwise traditional shade. Standard Cordlock – Cords run along the back side of the shade and go through a cordlock mounted under the wood headrail. As the shade is raised, the cords will get longer. Because the fabric comes off the front of the shade, in order to get to the cords, you’ll first need to pull the fabric out of the window to get to the cords. The great thing about this option is that if you have a very small recess you’re working with, the wooden headrail can be as small as ¾” allowing for the shade to be installed without protruding into the room. Cords, however, do pose a danger to small children and animals and when the shade is up, the cords should be wrapped around a cord cleat in order to keep them as safe as possible. Continuous Cordloop – Cords run along the back of the shade and up to a tube. The tube is controlled by a continuous cordloop behind the shade (unless designed with a valance in which the cordloop can be on the front of the shade) which spins the tube and the cords bring up the shade. This is a great option as there are no long cords. However, due to the size of the tube, a deeper recess is required for inside mount shades. Cordless – Cordless is quickly becoming one of the more popular options. It’s a great option when there are small children or pets in the home. However, if the windows are tall, this may not be the best option as you will need to reach the bottom of the shade to bring it down. See a demonstration of a cordless control option here. Hard Wired – Hard wired motorized roman shades allow all of the benefits of battery operated shades without the maintenance of changing the batteries. Our Somfy motors allow for heavier shades to be operated with a push of a button and can also be installed with our somfy mylink enabling you to operate your shades with not only a remote or wall switch, but by your smart device as well. Top Down Bottom Up – The top down bottom up option is our most popular upgrade feature. With a cord on each side of the shade, one will raise the intermediate rail allowing for the top of the window to be open while the other cord will raise the bottom rail allowing the whole shade to go up. This is a wonderful option for bathrooms or bedrooms where natural light is important, but privacy is needed in the room. Valance – A valance can be added at the top of the shade to add a finished look or a pop of pattern. Often times, we’ll add a valance off the front of the shade and have the fabric for the roman shade coming off the back of the headrail so that controls can be located on the front of the shade making them more accessible. Banding – Accent banding can be added using a coordinated fabric or a premade trim. The banding adds definition and interest to the shade. Because all of our shades are completely custom, you can determine exactly where you want the banding along with how set in the banding is and how wide it is. Decorative trimmings – Decorative trimmings can add a touch of detail you won’t see on anything but custom shades. It may be a 1” braid or a 2 ½” woven or even a dangling bead that adds color and your own personal style.